We have been talking about the Fresh Conference, which is somehow the “IT” conference for latest innovations in the event industry in our latest posts, because Klewel is proud to have been there and captured such an important event the meetings industry. Through the introduction of new techniques for the event industry to keep an event up-to-date with the latest gadgets and keep the lectures interesting by having a ‘throwable’ microphone in the audience for example or the latest apps that lets you do many different things throughout an event, the key-feature that can still make or break a conference is the interesting topics of the lectures. Of course people attend conferences because it is where you can learn of new technologies and enhance your knowledge with new information, therefore the audience’s general interest is guaranteed in way, it is still a challenge to have the participants stay interested during seven hours of lectures during the day. Now, having said all that, I just found a very interesting conference through our archives that strucks me and I am sure you will find it interesting too. Klewel was in Porto last fall to capture the lectures of many renowned doctors and pediatricians at the 54th Annual Meeting of the European Society for Pediatric Research. Now, if you say that this is not for you, because you are not a parent yet, I understand. However, if you I ever want to be a parent, these lectures might just be interesting for you. Maybe not now, but that is why Klewel webcasting solutions provide such a great answer for you through Nestlé Nutrition Institute in this case. You do not have to watch it now! However, if you ever want to, it is here. The knowledge has been saved. Talking about this particular conference, it is very interesting to see how much preterm infant survival rate has increased in the past decade. With that, many new questions have arisen to make sure that the preterm baby can receive all the care at the very beginning to grow up to be healthy. One of these topics has been the nutrition needs and concerns of a preterm baby. 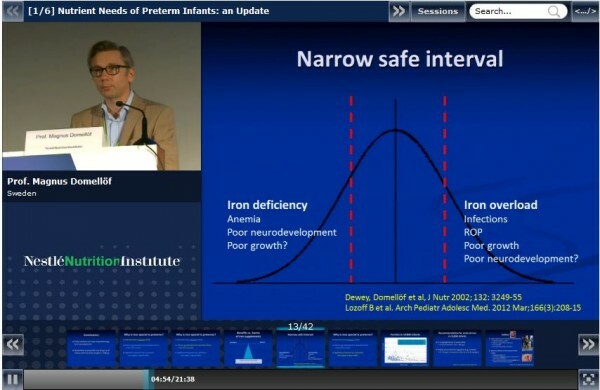 Prof. Magnus Domellöf from Sweden touched on the subject of how “Microminerals, including iron, zinc, copper, selenium, manganese, iodine, chromium and molybdenium are essential for a remarkable array of critical functions in preterm infants. On the other hand, several of these elements can also be toxic in high concentrations so it is important to carefully define requirements in order to avoid both deficiencies and adverse effects.” Please click on the image below to be able to watch the rest of the presentation. Other well-known doctors, like Prof. Richard Cooke has talked about how to improve growth in preterm infants and Prof. Jean-Charles Picaud introduced how, why and when should prebiotics be used for preterm infants. Of course, the list goes on with interesting topics in the subject. It gives great pleasure to Klewel to be able to work with such project to bring more knowledge and information to the medical community through Nestlé Nutrition Institute to better our future. Nestlé Nutrition Institute recognized the importance of sharing science-based information to educate people. This is where Klewel solutions provide an extremely useful tool for them. By recording and archiving their conferences, workshops and symposiums they are able to educate us on these rather interesting topics. Our Triskel station archives the contents in a way that is easy to retrieve, watch and search later. With live streaming the event, it was made available for a broader audience, even for the ones that could not make it to the workshop, which was a great success.